Healthy eating means cooking from scratch at home the "waterless' way. The Chef's Secret® 15pc 12-Element T304 Stainless Steel Cookware helps you cook healthier, while saving time and money. Featuring our latest state-of-the-art design, the 12-Element construction spreads heat quickly and evenly, and retains that heat so you can cook at lower temperatures. Featuring extra heavy-gauge stainless steel and Steam Control' valves, healthy waterless cooking is now easier than ever. 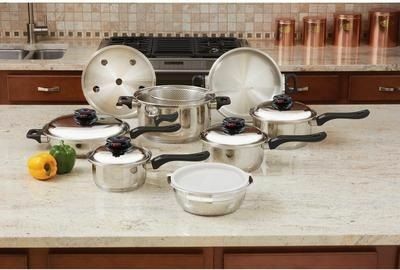 Our 15 piece set includes: 1.7qt saucepan with cover, 2.5qt saucepan with cover, 3.2qt saucepan with cover, 7.5qt roaster with cover, 11' skillet, dome cover, mixing bowl with cover that will also work as a double boiler, steamer rack, and deep fry basket with handle. Limited lifetime warranty. White box.